Today’s mobile workers require real-time communications and access to critical business data to make informed decisions at the point of customer service. Many of these information workers utilize multiple devices—such as smartphones, VoIP phones, two-way radios, laptop or tablet computers, GPS navigation systems, and bar code scanners—throughout the course of a normal business day. Today’s mobile workers require real-time communications and access to critical business data to make informed decisions at the point of customer service. Many of these information workers utilize multiple devices—such as smartphones, VoIP phones, two-way radios, laptop or tablet computers, GPS navigation systems, and bar code scanners—throughout the course of a normal business day. Honeywell’s Dolphin® 6000 Scanphone converges the functionality of these devices into a single, durable, pocket-sized device that delivers multi-purpose utility at an affordable price. In addition to providing basic cell phone unctionality, the Dolphin 6000 offers advanced productivity features geared towards today’s vertical work force. An integrated scanner provides fast and accurate bar code scanning,greatly simplifying data entry tasks. 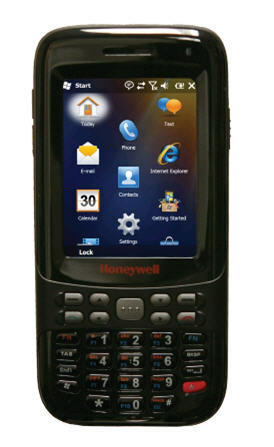 The Dolphin 6000 utilizes the Microsoft® Windows® Mobile 6.5 Professional operating system; includes embedded Honeywell software utilities; and is compatible with Honeywell’s Remote MasterMind® for Mobility device management software, providing enterprise-class application support that lowers device deployment and management costs. Return on investment is further ensured by a three-year life cycle with five years of continued support, significantly reducing application porting and device certification costs associated with short-lived consumer devices. Unlike fragile consumer-grade mobile phones, the durable Dolphin 6000 delivers years of reliable operation. Featuring an IP54-sealed enclosure, the Dolphin 6000 can endure exposure to dust, dirt and splashing water,and survive accidental drops to concrete from up to four feet. An optional three-year Honeywell Service Made Simple plan helps ensure device availability and performance at fixed costs. Bridging the gap between consumer-grade mobile phones and industrial-grade mobile computers, the Dolphin 6000 empowers mobile information workers to make informed business decisions at the point of customer service, wherever business takes them.